Since the Middle English period many writers have used farther and further interchangeably. According to a relatively recent rule, however, farther should be reserved for physical distance and further for nonphysical, metaphorical advancement. Thus 74 percent of the Usage Panel prefers farther in the sentence If you are planning to drive any farther than Ukiah, you’d better carry chains, and 64 percent prefers further in the sentence We won’t be able to answer these questions until we are further along in our research. That couldn’t be further from the correct words. If you mean a physical distance, then farther is correct; for a metaphorical distance, the correct word is further. Nothing could be further from the truth. If you’re describing a physical distance, then farther is the right word; otherwise, the right word is further. Unless the distance from the truth is measurable, the correct word is further. Need further explanation? See the American Heritage Dictionary. Many writers since the Middle English period have used farther and further interchangeably. A relatively recent rule, however, states that farther should be reserved for physical distance and further for nonphysical, metaphorical advancement. The Usage Panel has favored this rule for some time. In our 1987 survey, 74 percent of the Usage Panel preferred farther in the sentence If you are planning to drive any farther than Ukiah, you’d better carry chains, while 64 percent preferred further in the sentence We won’t be able to answer these questions until we are further along in our research. While the use of both adverbs was acceptable in these examples in our 2009 survey, only 62 percent accepted the use of further in the drive sentence quoted above, and only 58 percent accepted farther in the research example. Approval of usage following the rule was nearly unanimous. If you’re describing a physical distance, use farther; further is further from correct. The adverb farther should be used for physical distances only; use further for nonphysical advancement. This is allegedly about something called “Hearty Eggs,” but nothing could be further from the truth. 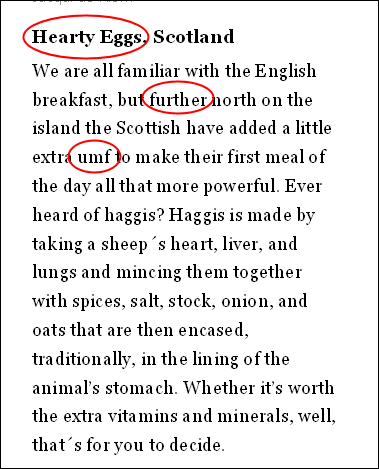 It’s really about haggis. It’s clear the writer was a tad confused about her subject, just as she was confused about the difference between further and farther, the word that refers to real, physical distance. But nothing says “I don’t give a sh*t” like umf, which I take to be a lazy writer’s attempt at oomph. Umf is not a word, but it is an abbreviation and according to the Urban Dictionary it means “ugly motherf***er,” which I don’t think the writer meant. Although if she reads this, she may be thinking that.